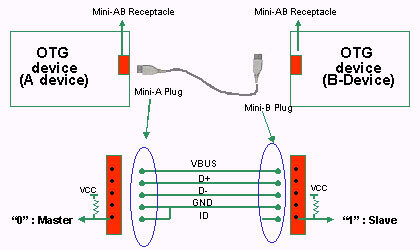 USB is standards for connecting peripherals. This article you introduce into the theme. Universal Serial Bus, or USB, is a computer standard designed to eliminate the guesswork in connecting peripherals to your PC. USB came into life when a group of 7 companies : Compaq, Digital Equipment, IBM, Intel, Microsoft and Northern Telecom decides to form a specifications to merge legacy connectivity such as RS232, Printer port, PS2 port into a single common connector to the Personal Computer. Currently, the USB Specification, Revision 2.0, covers three speeds 480 Mbps, 12 Mbps, and 1.5 Mbps. The term "Hi-Speed USB" refers to just the 480 Mbps portion of the USB Specification. We now use the term "USB" to refer to the 12Mbps and 1.5Mbps speeds. USB On-the-Go is a supplement and compatible with the USB 2.0 specification and allows portable devices to connect to PCs and PC peripherals with USB ports. Portable devices with USB On-the-Go technology can transfer data directly to a peripheral without first having to connect to a PC. USB On-the-Go has been in development for some time, but it has attracted interest from manufacturers as developers such as TransDimension, Philips and Texas Instruments finish writing drivers that smooth the means of communications between portable devices. There is only one host in any USB system. The USB interface to the host computer system is referred to as the Host Controller. The Host Controller may be implemented in a combination of hardware, firmware, or software. A root hub is integrated within the host system to provide one or more attachment points. Hubs are a key element in the plug-and-play architecture of the USB. Hubs serve to simplify USB connectivity from the user’s perspective and provide robustness at relatively low cost and complexity. Each USB segment provides a limited amount of power over the cable. The host supplies power for use by USB devices that are directly connected. In addition, any USB device may have its own power supply. USB devices that rely totally on power from the cable are called bus-powered devices. In contrast, those that have an alternate source of power are called self-powered devices. A hub also supplies power for its connected USB devices. A USB host may have a power management system that is independent of the USB. The USB System Software interacts with the host’s power management system to handle system power events such as suspend or resume. Additionally, USB devices typically implement additional power management features that allow them to be power managed by system software. USB On-the-Go is a point-to-point communication standard. It still maintain master/slave at any point of time. The point-to-point capability lies on a defined mechanism allow swap of master and slave roles. The point-to-point connection is not limited to the same kind of products. Different product can connect to each other. The maximum cable length is 5 meters. Anything longer starts to cause problems due to propagation delays. Assuming worst-case delay times, a full speed device at the bottom of 5 hubs and cables has a timeout margin of 280ps. Reducing this margin to 0ps would only give you an extra 5cm, which is hardly worth the trouble. USB is the multiplatform standard for the personal computer industry. It effectively eliminates previous platform distinctions between peripherals, allowing customers to choose from a much wider range of devices with complete confidence that they are making a safe investment—by allowing them to share devices with users of the same and other platforms.